Its really not a good time for Selina Kyle, or should I say, Selina Kyle-Calabrese. The head of the Calabrese crime family that rules a good portion of Gotham. She also happens to be in direct opposition to Roman Sionis aka the Black Mask and the Hasigawa family, though she is courting them for now and has a temporary alliance in place. With the advent of the new creative team, the title has undergone a serious makeover and has come off the better for it thankfully, with a superb crime story that also has some really great thriller moments to it. When last we were with Selina, she had just ordered the death of her cousin, at the hands of his sister no less, and was also taken down a few pegs in the eternal battle for control of all criminal activities in Gotham. That definitely hurt her reputation and now in Catwoman #38 we see how she plans to bounce back from all of that, to regain the lost prestige of her family, and to come out of the experience with a solid and even unenviable position amongst all the other families. The story is great, the art is great, what more can you want really? This issue is the usual 20 pages or so but for some reason it felt as if I was reading something much bigger. And I totally know why that is, because writer Genevieve Valentine packs a hell of a lot of different things in this issue. With the loss of prestige that came with having Antonia kill Nick since he was outed as a whistler for Gotham PD, Selina now has to make some amends and she has an incredibly dangerous plan for doing so. I kind of like this new Selina, but she is someone who thinks several steps ahead, is utterly serious about running the Calabrese family, though not without making sure to everyone what the power structure is like and that she can be as ruthless as any one else. And yet, in the middle of all of that, she’s also someone who is emotionally vulnerable, shaped by all her experiences to date, and still undergoing a transformation, so to speak. This issue contains a ton of character development, and it also has some great politicking between the various families. Sionis is pressing his advantage over Selina, while Eiko Hasigawa and her family are also finally taking concrete sides in the whole damn affair since Eiko happens to be the new Catwoman (Selina having given up her tights and leathers). That’s what I loved so much about the comic, all that political backstabbing and out-maneuvering and all. Its really fun and layered and Genevieve Valentine seems to rather be an old hand at it or something. I mean, she really pulls you into this complex web that she’s built up over the last four issues of this arc and every installment has been brilliant, without a doubt. Plus, she goes and seriously expands the world that she’s dealing with, bringing in some other familiar characters from Gotham’s criminal fraternity, and also fully showcasing the Caped Crusader as well in a three-way fight that I definitely didn’t see coming previously. 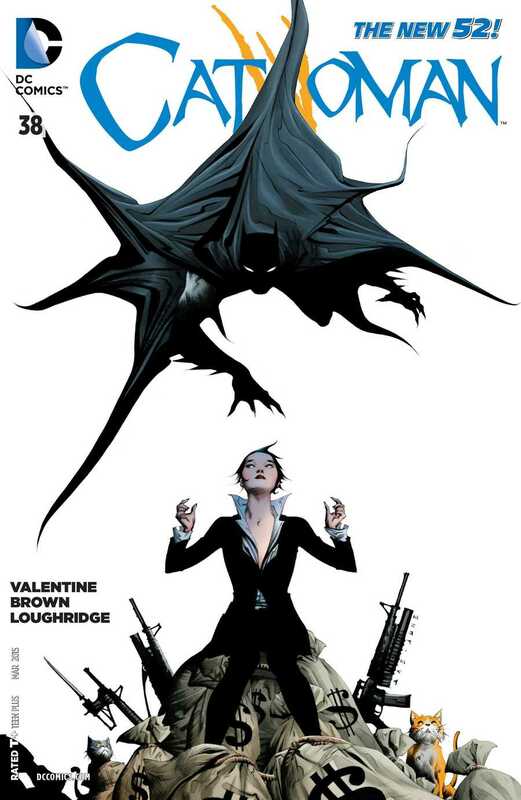 And it is all handled with aplomb, and the way that the final moments of this issue pan out, well, it is all a plan well-executed that is going to have some repercussions in next month’s issue, and is going to be a really, really tough time for Selina above everyone else. But that’s the really fun part right, the anticipating and all? Garry Brown is the artist here with Lee Loughridge on the colours, Carlos M. Mangual on the letters and Jae Lee and June Chung on the cover. There were some bits here and there where the minimal art really didn’t work so well, but apart from these small handful of instances, the art was phenomenal as usual. The wordless panels here are really brilliant, showing a story without any kind of overriding dialogue and the more… popular and familiar characters of the city are also rendered really nicely so nothing to complain about. More Catwoman: #25, #27, Future’s End, #35, #36, #37, Annual #2.